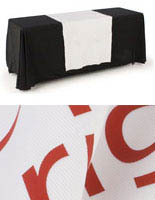 These cloth overlays are the economic table runners most people order. Priced to sell, you won't find a lesser expensive table accent anyplace else. 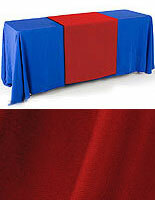 These blue table drapes, table runners come in a rich royal polyester blue fabric. Width is 30" and length is 80". 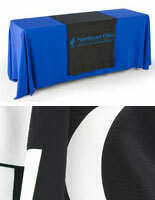 The blue table runners will drape over the front, top, and back of your tradeshow or registration event tables. 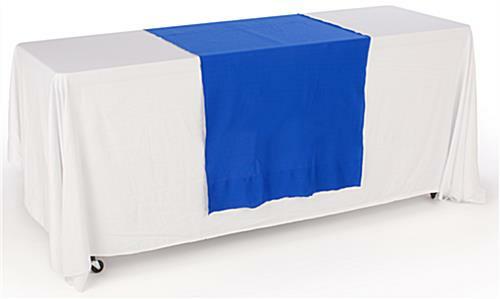 We supply blue table runners for sale as an accent to go over table covers or skirts. On the other hand you can use them alone for an economic decoration on plain tables. 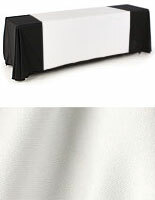 The table drapes, table runners will fit tables of any size, making them real flexible in their application. 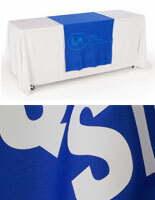 Our blue table runners are machine washable as well as iron safe. For those attending tradeshow and other registration events, it's important to point out our runners always come with flame-test certificates. 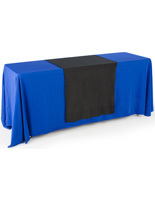 Blue table runners, such as table overlays and covers, are a simple means to elevate your booth with a little style affordably. 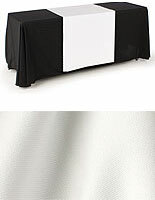 Buy table runners for your next event!